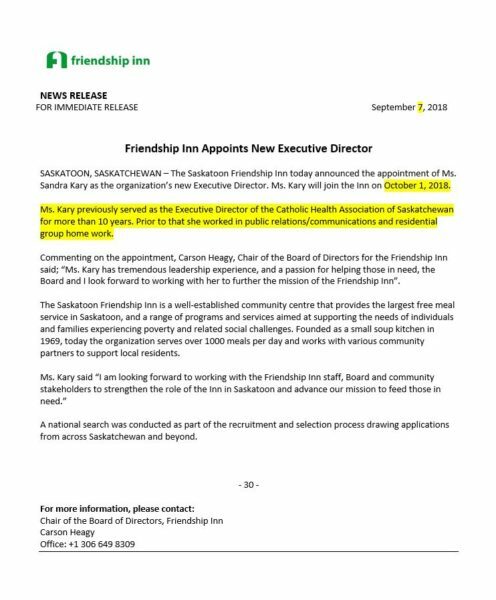 The Saskatoon Friendship Inn today announced the appointment of Ms. Sandra Kary as the organization’s new Executive Director. Ms. Kary will join the Inn on October 1, 2018. Ms. Kary previously served as the Executive Director of the Catholic Health Association of Saskatchewan for more than 10 years. Prior to that she worked in public relations/communications and residential group home work. Commenting on the appointment, Carson Heagy, Chair of the Board of Directors for the Friendship Inn said, “Ms. Kary has tremendous leadership experience, and a passion for helping those in need. The Board and I look forward to working with her to further the mission of the Friendship Inn”.